This article is about the district. For the city, see Tangail. For the upazila, see Tangail Sadar Upazila. Tangail (Bengali: টাঙ্গাইল জেলা) is a district (zila) in the central region of Bangladesh. It is the largest district of Dhaka division by area and second largest by population (after Dhaka district). The population of Tangail zilla is about 3.8 million and its area is 3,414.28 km². The main city of the district is Tangail. It is surrounded by Jamalpur District on the north, the Dhaka and Manikganj Districts on the south, the Mymensingh and Gazipur on the east, and the Sirajganj on the west. 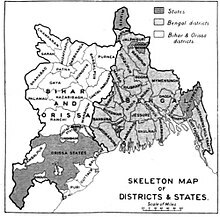 Until 1969, Tangail was part of Greater Mymensingh. Tangail was made a separate district due to suppress Mymensingh District's dominion. Before partition of 6 Upazila incident Mymensingh District's economic growth was higher than the capital Dhaka. To suppress Mymensingh, Greater Mymensingh was separate from their 7 out of 6 Upazila Tangail, Sherpur, Jamalpur, Netrokona (Presently known as District) History of Mymensingh#cite note-Iffat Ara 1989-16 from Mymensingh. And 6 sub-district were promoted to district status to avoid conflict with Dhaka. Thus Tangail district was born. The main rivers that cross the Tangail district are the Jamuna, Dhaleshwari, Jhenai, Bangshi, Louhajang, Langulia, Elongjani, Jugni, Pouli, Fotikjani and the Turag. The subdivision of Tangail was established in 1870. It was turned into a district on 1 December 1969. The district consists of 11 municipalities, 108 wards of these municipalities, 109 Union Parishads and 2516 villages. According to the Bangladesh Bureau of Statistics 2011, the total population of Tangail District was 3749085. The total area of the zila is 3414.28 km2 (1318.00 sq mi), of which 497.27 km2 (192.00 sq mi) is forested. The zila lies between 24° 01′ and 24° 47′ north latitudes and between 89° 44′ and 90° 18′ east longitudes. Tangail has a tropical climate. In winter, there is much less rainfall than in summer. According to Köppen and Geiger, this climate is classified as Aw. The temperature here averages 25.5 °C. About 1872 mm of precipitation falls annually. Tangail district is flanked on the west by the Jamuna River, which is over 4 miles wide during the rainy season. The Dhaleswari, first an old channel of the Ganges and then of the Brahmaputra, cuts across the southwestern comer of the district on its powerful sweep to join the Meghna near Narayanganj. The old name of Dhaleswari was "Gajghata". It used to flow afterward by the Salimabad channel and then at last by Porabari channel. A part of the eastern boundary of the district runs close to the Banar river. The river Bangshi flows almost down the middle of the district, branching out from the old Brahmaputra to the north from near Jamalpur. Bangshi falls into Dhaleswari near Savar, in Dhaka district. The Bangshi forms a natural barrier to the Madhupur Jungle on the Tangail side, all the way from Madhupur to Mirzapur. It is only fordable at two or three places near Basail on its way to river Meghna. Dhaleswari itself, however, takes out from the Jamuna from inside Tangail district. Among other important rivers of the district, Lohajang is worth mentioning. It flows past the district headquarters of Tangail and is almost dead at present (in moribund condition). Other rivers are Khiru, Nanglai Nadi, Atai, Elengjani, Fatikjani, Bairan and Jhinai. The old Brahmaputra's most important offshoot is the Jhinai; striking off near Jamalpur it rejoins the Jamuna north of Sarishabari, while another branch flows past Gopalpur. Now these subsystems of rivers, viz Bangshi and Banar, and the Lohajang, Khiru, Nangtai Nadi, Atia and Jhinai are dying out because of the shift of the old Brahmaputra river from its former channel to the present Jamuna channel. In Tangail, the average literacy rate as of the 2011 census was 47.8%; male 50%, female 43.8%. Before the Liberation War, some educational institutions were established by notable persons of Tangail. Santosh Jahnnabi High School was established in 1870. It is the oldest school in Tangail and the second oldest in the greater Mymensingh district. Bindubasini Govt. Boys' High School was established. In 1880 and Bindubasini Govt Girls' High School was established in 1882. Both are in downtown, Tangail. These are nationally rewarded Double Shift Schools. In 1926, the Government Saadat University College was established by Wazed Ali Khan Panni, a zamindar and educationalist of Tangail. He named it after the name of his grandfather Saadat Ali Khan Panni. Govt. M.M. Ali College was established by Maulana Abdul Hamid Khan Bhasani at Kagmari (1 km from the main city) is one of the (First Govt. College) topmost colleges in Bangladesh. Kumudini College was established in 1943 by Ranada Prasad Saha (R.P. Saha), philanthropist of Tangail. He named it after his mother Kumudini. Later the college was converted into Kumudini Government Women's College. He also established Bharateswari Homes in 1945 at Mirzapur. He named it after his grandmother Bharateswari Devi. Mirzapur Cadet College, the third cadet college of Bangladesh, was established in 1963. The then president of Pakistan Field Marshal Ayub Khan took initiatives to establish this cadet college. The famous Neogi family of Tangail, till the time they left during Partition, contributed much to the spread of education, with other zamindar families like the Roy Chowdhuris and the Majumdars. Currently, there are five Government high schools in the city: Bindu Basini Govt. Boys’ High School and Bindu Basini Govt. Girls' High School (established in 1880 and 1882 respectively by zamindar of Santosh—the famous Roy Chowdhury family who were co-founders of the East Bengal club of Calcutta), Shibnath High School, Vivekananda high school, Police Lines high school, Zilla Sadar girls' high school and Santosh Jannabi Govt. high school. Tangail has 341 non-government high schools, 86 satellite schools, 5 government colleges, 48 non-government colleges, 3 university colleges, 2 textile engineering colleges, 1 medical college, 1 law college, 1 homoeopathy college, 1 polytechnic institute, 1 Medical assistant training school, 2 nursing institutes, 1 police academy, 202 madrasas, 40 secondary schools (SSC), 941 government primary schools, 395 non-government primary schools, 1 teachers' training school, 146 community primary schools and 1304 NGO-operated schools. There is a technical university named Mawlana Bhashani Science and Technology University at Santosh, Tangail. A government medical college (Tangail medical college) is located at Sabalia area of tangail sadar. Tangail medical college was established in 2014. The urban growth rate of Tangail District is increasing as it is close to the capital of Bangladesh, Dhaka. There are 11 municipalities in Tangail District. Tangail municipality is planned to be converted into a City Corporation in next couple of years alongside 11 other old district headquarters of Bangladesh. Agriculture is the main occupation of the Tangail district. About 49.53% of people are involved with agricultural activities. Its main agricultural products are paddy, potato, jute, sugarcane, sesame, linseed, wheat, mustard seed and pulse. About 3,386.53 km² cultivable lands are available in Tangail. The main fruit products are mangos, jackfruit, bananas, litchis, and pineapples. Other sectors, such as fisheries (446), dairies (189), industries, weaving and poultry farms (538) are developing in the Tangail district. Tangail is the home of the weavers of the world-famous "Tangail Saree". Tangail Sari a handloom saree made of cotton and silk thread having hand-worked butti design, all-over flowery design, or contemporary art motif is appreciated, bought, and used by women and girls of Bangladeshi and Indian origin all over the world. Tangail Saris are famous at home and abroad. Large numbers of sarees are sold on the occasion of Eid, Puja, Pahela Boishakh and wedding season between November and February. The weavers get orders from home and abroad. Tangail Sarees are produced in Tangail Sadar Upazila, Delduar Upazila and Kalihati Upazila. Pathrail in Delduar Upazila and Barabelta, Kabilapara (Porabari Union) in Sadar Upazila are famous for fine and expensive sarees. A survey conducted in 2013 said there were 60,000 looms in Tangail. Of them, 8,305 are pit looms, 51,141 are Chittranjan looms and 892 are power looms. About 325,000 labourers, owners and traders are connected with the profession. The factories have been producing Tangail sarees worth Tk 300-Tk 20,000 apiece. There are many industries growing rapidly in Gorai Industrial Area. These include Square Group, Nasir Glassware industry, Olympic Battery, North Bengal cycle industry, and Tangail Cotton mill. There are many garments and textiles in Gorai. BSCIC Tarotia also has some industries. Alauddin Textile mill is in Tangail. Abdul Mannan, Home and Family Planning Minister (1972-1975), MNA (1970), MP (1996-2001), Established, Tangail General Hospital, Govt.Sheikh Fajilatunnesa Mujib College, Atia College. Wikimedia Commons has media related to Tangail District. ^ "Unesco: Bangladesh literacy rate reaches all-time high of 72.76% in 2016". Dhaka Tribune. 21 March 2018. Retrieved 20 January 2019. ^ "Tangail P-XV" (PDF). Bangladesh Bureau of Statistics. 11 June 2011. Retrieved 23 February 2016. ^ D. Shamsul Haque Mia (March 1999). Education in Tangail. Tangail Forum. pp. 26–27. ^ "Local Government Engineering Department". Retrieved 12 February 2014. ^ "Tangail District table: C01, P-01" (PDF). BBS. 11 June 2011. Archived from the original (PDF) on 13 November 2014. Retrieved 22 February 2016. ^ "Weaving industry hit hard by political unrest". The Independent. Dhaka. 2 March 2015. ^ "List of 10th Parliament Members". Retrieved 25 May 2014.